The presence of a castle at Tarradale in the 13th and early 14th centuries is known from documentary sources but the actual site of Tarradale Castle is unknown. In the past it was considered to be represented by a ring ditch in the field immediately to the west of Tarradale House but the Tarradale Archaeological Project recovered no field walking evidence (such as pottery) for medieval occupation. 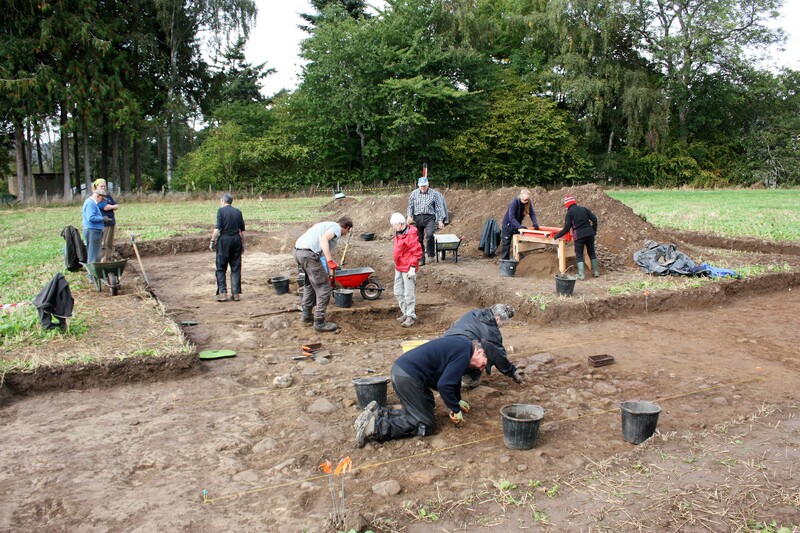 However, field walking and metal detecting by the Tarradale Archaeological Project discovered a concentration of medieval pottery as well as large nails and a small number of 13th century silver coins in the fields immediately to the east and north-east of Tarradale House. 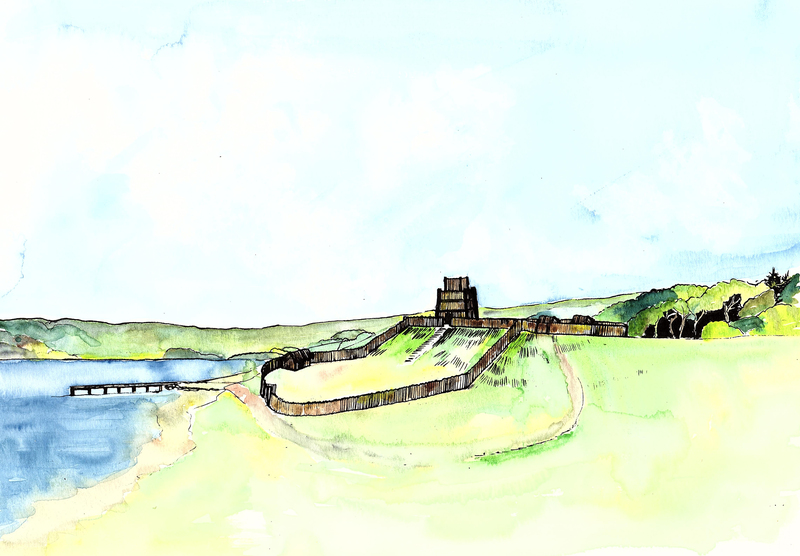 The topography, developed on two levels of raised estuarine beaches, with a steep slope between, suggested there might be a main defensive castle site on the upper level with the domestic activity bailey on the lower level adjacent to the Moray Firth. A magnetometer survey of the supposed sites of the motte and bailey undertaken in January 2017 gave a generally poor result, but there appeared to be evidence of curved features (such as a ditch or bank) which were considered to be equivalent to a motte or possible ring work, while on the lower level there appeared to be the western component of a ditched enclosure of a possible bailey. 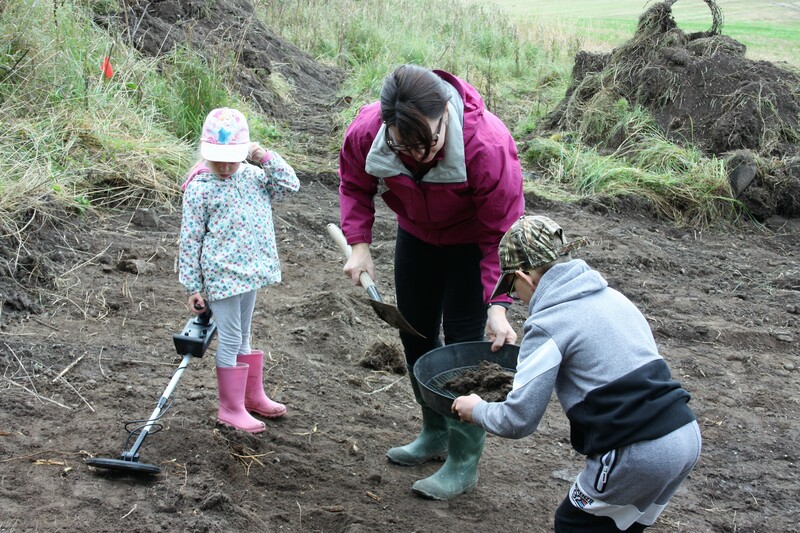 A small test pit excavation at the foot of the slope between the upper and lower levels undertaken in 2015 provided no evidence of medieval settlement occupation but did indicate the presence of a shell midden (see Mesolithic shell middens section below). On the strength of the magnetometer evidence, the TARRADALE THROUGH TIME project excavated the upper and lower levels in September to October 2017, and although initially there appeared to be clear evidence of stone filled ditches or causeways, evaluation suggested that the features were not man-made but rather varying deposits of sand, gravel and boulders whose apparently ditch-like pattern resulted from their being deposited in an ancient streambed. In the relatively small area that was excavated, there was no evidence of human occupation. The proposed upper level defensive castle site, September 2017. Similarly on the lower level, the putative bailey site, the apparent enclosing ditch shown on the magnetometer survey turned out to be very shallow although some medieval pottery was preserved in the bottom of the ditch. The lack of any positive evidence of castle -like structures from excavation (in contrast to the wealth of field walking finds in the same locations) is difficult to explain. 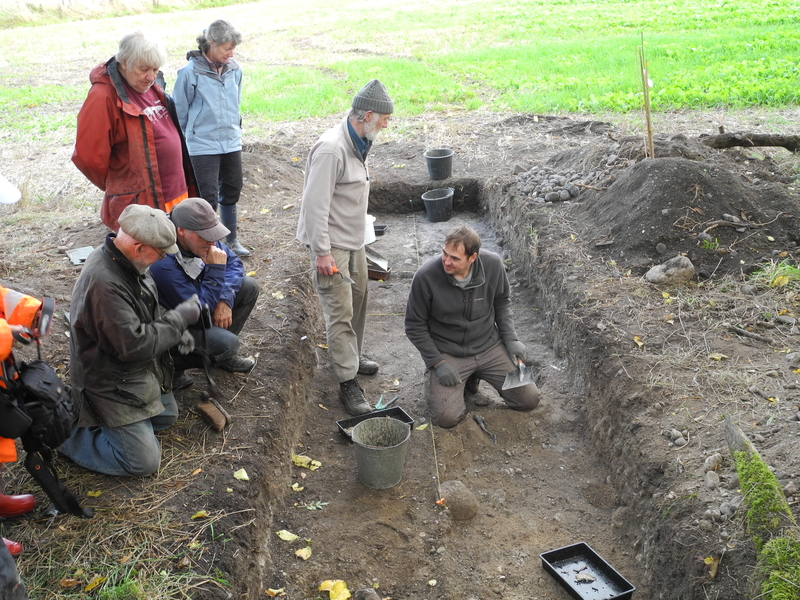 The density of medieval pottery revealed through field walking at the putative castle site is many times greater than the density of medieval pottery anywhere else in the study area. 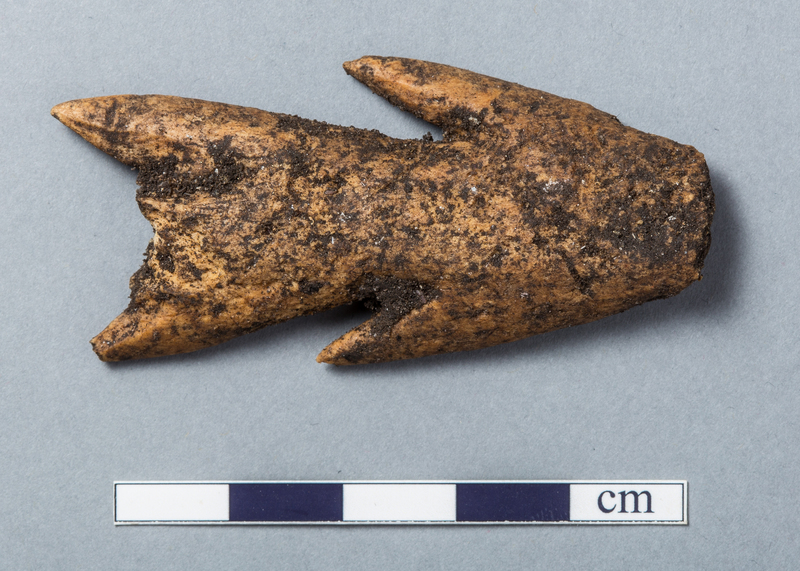 In addition, within or near the inferred castle site there had previously been the significant field walking finds of a decorative plaque from a medieval horse harness, medieval coins and large hand made nails. 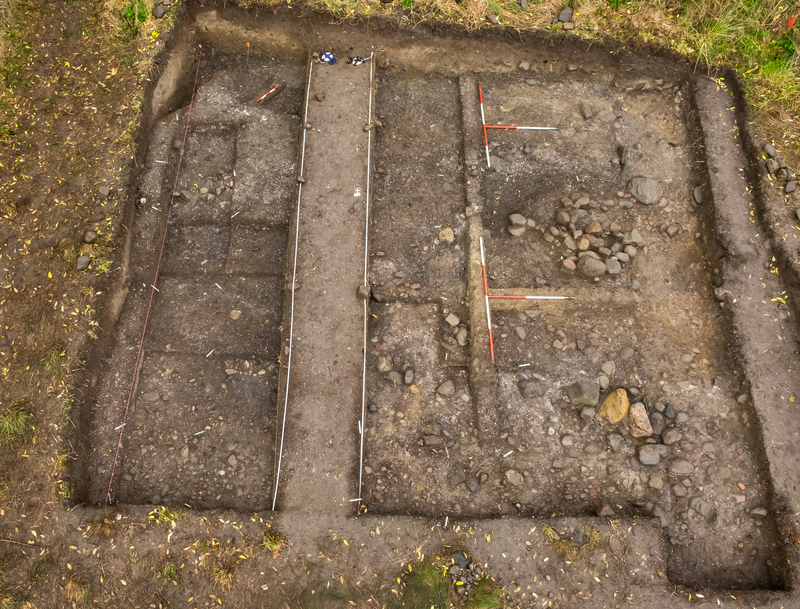 One suggestion for the lack of excavation evidence is that the whole site may have been comprehensively destroyed after it was captured by Robert Bruce in 1308, and we know that the castle was never rebuilt. Further degradation of the site could be due to agricultural activity and also to the possible removal of soil to level the lawn of the adjacent Tarradale House. However, we are not writing off the site yet as we are convinced that the site of Tarradale Castle is still close to the inferred area and further magnetometer survey, test pitting and larger scale excavations may yet reveal buried structures. Artist’s impression of what Tarradale castle may have looked like, by Pat Haynes. Aerial photograph of Trench 2B, October 2017. Trench 2B on the final full of day of excavation, October 2017. 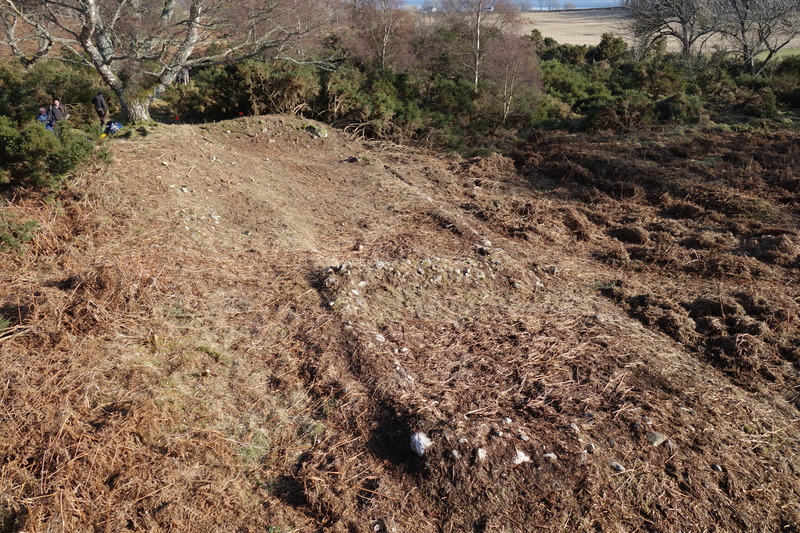 In October 2017, Tarradale Through Time evaluated two separate shell midden sites, labelled 2A and 2B, situated on raised beach features at c 9m OD to the east of Tarradale House. 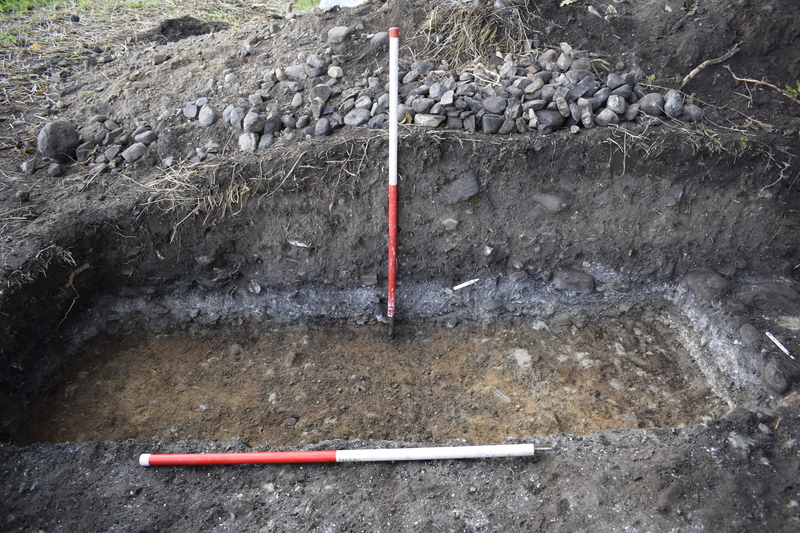 Site 2B, located approximately 100m to the southeast of Tarradale House had been partly investigated by NOSAS in 2015, when an area of cobbling was revealed beneath layers of shell midden (DES 2015, 118-119). Radiocarbon dates obtained from single entity antler and charcoal samples suggested occupation around 4500 to 4200 cal BC (DES 2016, 117-118). In 2017, excavation extended that initial trench for some metres to the west and towards the base of the steep bank. The shell midden layers were investigated by excavation using a grid system for the recovery of small finds and wet-sieving and flotation of samples. Hand-retrieved material included frequent fragments of worked and unworked bone, tooth and antler, some struck quartz flakes and three pieces of struck flint. At the base of the upper midden, a number of possible stone settings indicate that structural evidence may be preserved on the site. Significant artefacts recovered from within the shell layers included two antler T-axes (one fragmentary), of which only three are currently known from Scotland (all from central or western Scotland). Other important finds included a fragment of a biserial barbed antler point (i.e. spear or harpoon) and a handle manufactured from a red deer antler tine. 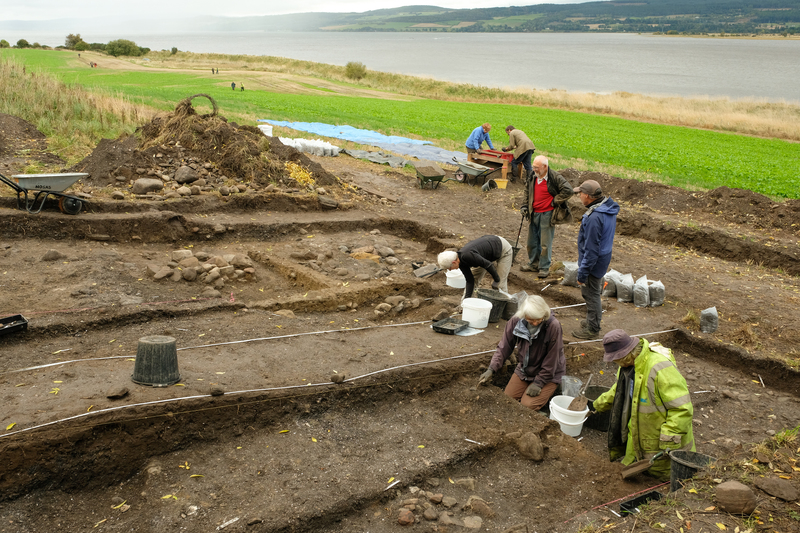 These finds indicate that the Tarradale Mesolithic site is of considerable significance not only in Scotland but within the British Isles and Europe. The addition of two further T-axes to the Scottish inventory changes the finds map by bringing northeast Scotland into a distribution that extends from eastern Europe through central Europe, the low countries and Denmark to Scotland. 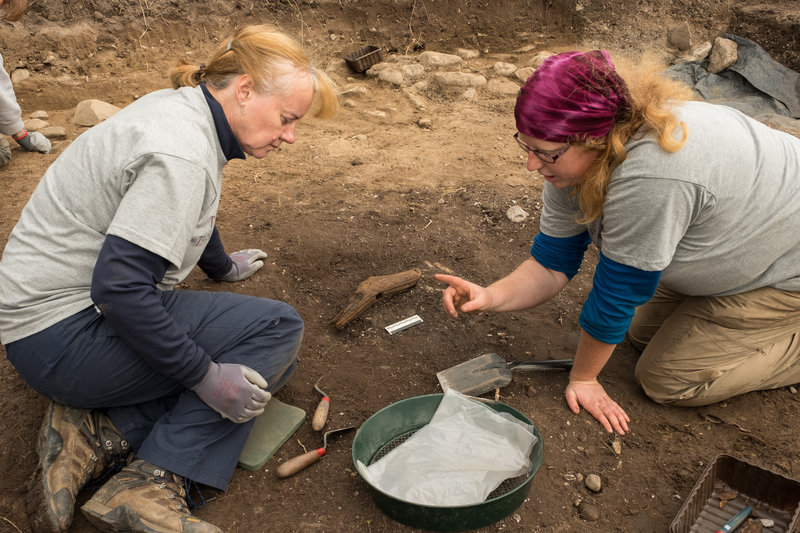 Sue and Cathy prepare to lift an antler T-axe in trench 2B. Antler T-axe (Michael Sharpe). For more info on T axes / mattocks see the article Facing the Chop by Ben J Elliott. Biserial barbed antler point (Michael Sharpe). All Michael’s small finds photographs can be found here. At Site 2A, a promontory ridge approximately 300m to the east of Site 2B, the location of a second possible shell midden site was evaluated by trenching and test pitting. These excavations showed clear survival of shell middens at both the top of the promontory and its base, located on the lower and upper raised beaches (c 9 and 17m OD respectively). On top of the promontory, test pits uncovered the location of a shell midden up to 20cm thick at the southeast end. Distinctive horizons were observed below the upper shell midden, suggesting different periods for the formation of the shell midden. Excavation was undertaken in 10cm spits for the recovery of artefactual and environmental material and sieving. A small amount of animal bone and quartz was recovered from this area, while, more significantly a collection of large struck stone flakes and a stone core were found. At the base of the ridge, two trenches examined the lower raised beach where extensive shell middens were again revealed, including upper and lower shell midden layers separated by a gravel and cobble interface. The shell consisted of mostly small fragments of mussel, oyster and scallop, with cockle shell present in the lower layer, and a thick deposit of whole oyster shells. Within the lower shell layer, a thin charcoal and ash layer was thought to represent in situ activity. Small finds comprised mainly worked and unworked mammal bone and antler and several struck quartz flakes. The paucity of lithic finds from both these complexes of sites suggest that the occupants were short of flint and resorted to using quartz and coarse stone, possibly supplemented by artefacts of antler, bone and teeth in lieu of flaked stone tools. C14 radiocarbon dating results and photographs of the antler tools following conservation can be seen here. Excavated shell midden at the base of the promontory, October 2017. Discussions in one of the trenches at the base of the promontory, October 2017. Further 2017 excavation photos can be seen here. At the time of compiling this blog (March 2018) three subprojects were in the process of planning. In April 2018 it is proposed to survey the house and kailyard sites of an abandoned township just north of Tarradale Mains farm. Several houses of poor tenants (mailers) are shown on the 1788 estate map but all had disappeared by the time of the first edition of the Ordnance Survey. In February and March 2018, NOSAS volunteers cleared scrub vegetation from the site revealing the footings of five or six buildings, some of which coincide with building shown on the 1788 map. All that survives of these buildings is their outline traced in irregular blocks of stone and round field-gathered stones. Our present understanding, subject to further investigation and evaluation, is that the foundations were of stone but above that the walls were made of layers of clay and turf interspersed with field gathered stones. Starting on 7 April 2018, NOSAS will carry out a detailed survey of the remains including instruction in plane table survey and survey by geolocation. If you are interested in finding out more about this project, including learning how to undertake archaeological survey work, please contact us through tarradalethroughtime@gmail.com. One of the recently cleared buildings at Tarradale abandoned settlement. 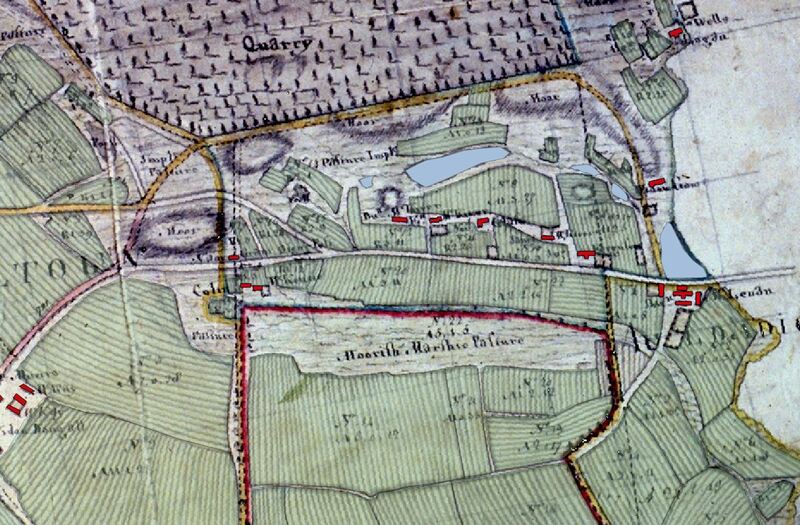 Part of the 1788 estate map with buildings highlighted in red. More info can be found on Tarradale Through Time website Blog. Two excavations are planned for September 2018, the first on the site of a small promontory fort near Gilchrist church. 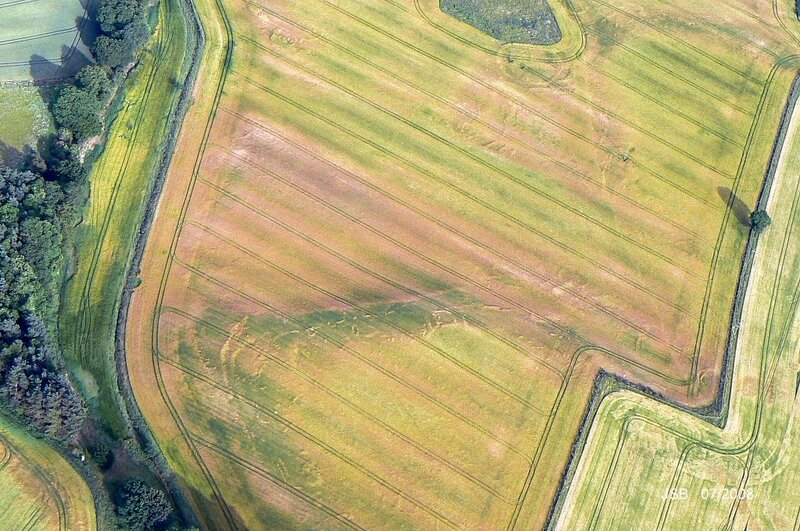 This feature is clearly shown on aerial photographs but nothing distinguishes it at ground level. It appears to be small defended promontory that jutted into a former kettle hole (now drained). Forts of that type are often considered to be Iron Age but at present we have no idea of the age of this feature. The proposed excavations will examine the banks and ditches that cut off the promontory as well as any internal structures. Aerial photograph of the promontory fort. near Gilchrist. 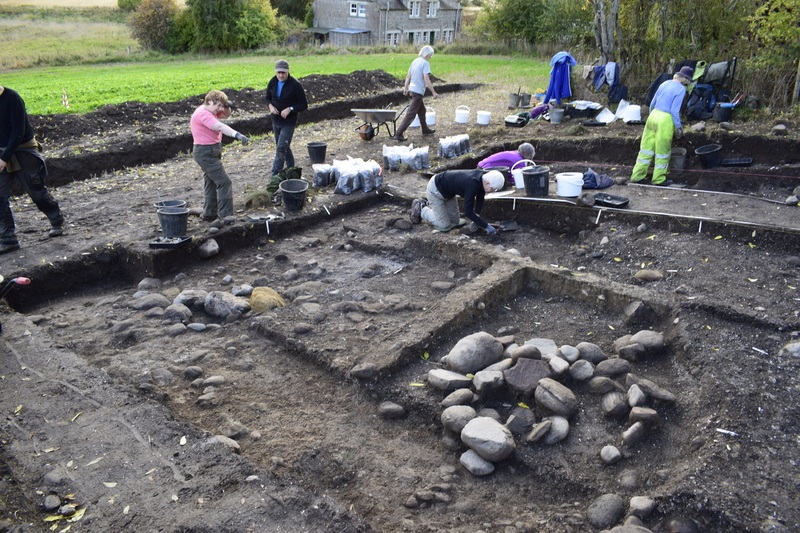 The second excavation site for September 2018 is what appears to be a ditched and banked settlement near Balvattie Cottage. Field walking recovered quite a lot of medieval pottery and slag from the field and our current interpretation is that this may represent some kind of medieval defended farmstead. Excavation will remove the topsoil and try and delimit and evaluate any surviving features. The site is close to another kettle hole (now full of wet marsh) and there may be a relationship between the site and the presence of standing water. Future research and investigation by TARRADALE THROUGH TIME in 2019 will examine the site of a large barrow cemetery and large ditched enclosure to the west of Tarradale House. In the 1990s Professor Barri Jones excavated part of the enclosure site which he initially thought may have been a Roman fortification. However it clearly is not Roman and the evidence he found suggested a multi-period occupation from Mesolithic through to early medieval. He did not investigate or comment on the potential relationship between this enclosed settlement and the nearby barrow cemetery. The barrow cemetery is one of the largest in Scotland and appears to have been used for a considerable period of time as the barrows within it (seen on aerial photographs) comprise large circular barrows, smaller circular barrows and square barrows. The proposed evaluation will examine part of the barrow cemetery that has now been ploughed out (with potential features apparent on aerial photographs) and a small rough area that appears never to have been ploughed that may still contain original barrows though there is some suggestion of disturbance of that site for extracting sand and gravel. 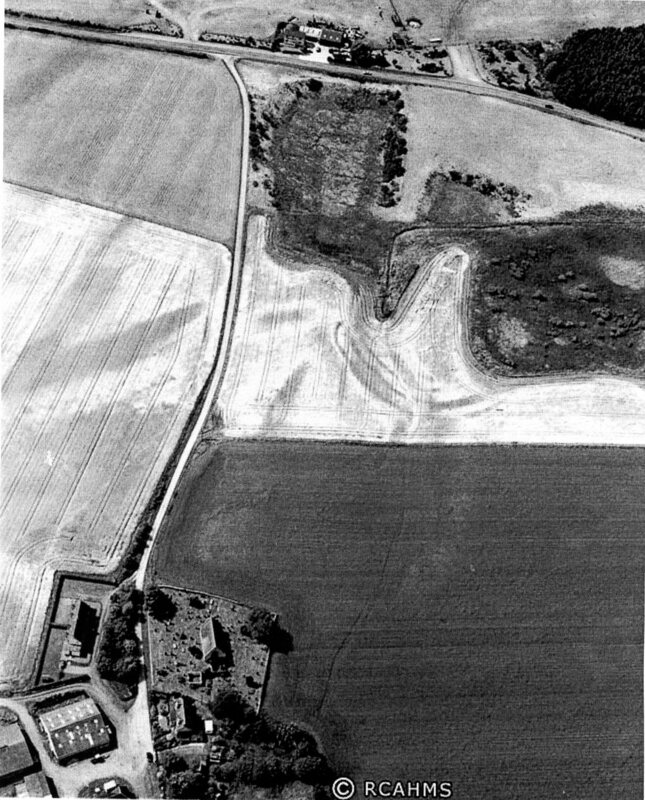 Aerial photograph of the barrow cemetery and ditched enclosure by Jim Bone ( see blog post for further information). 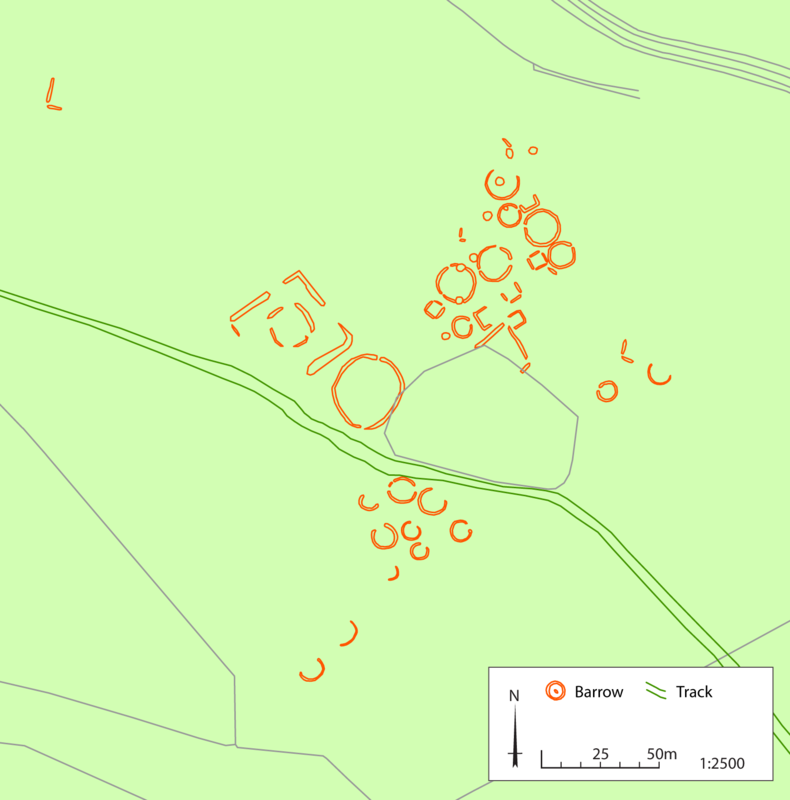 Plan of the barrows at Tarradale, copyright Juliette Mitchell, University of Aberdeen. TARRADALE THROUGH TIME has already proved to be an important project with the highly significant Mesolithic finds from the 2017 excavations. 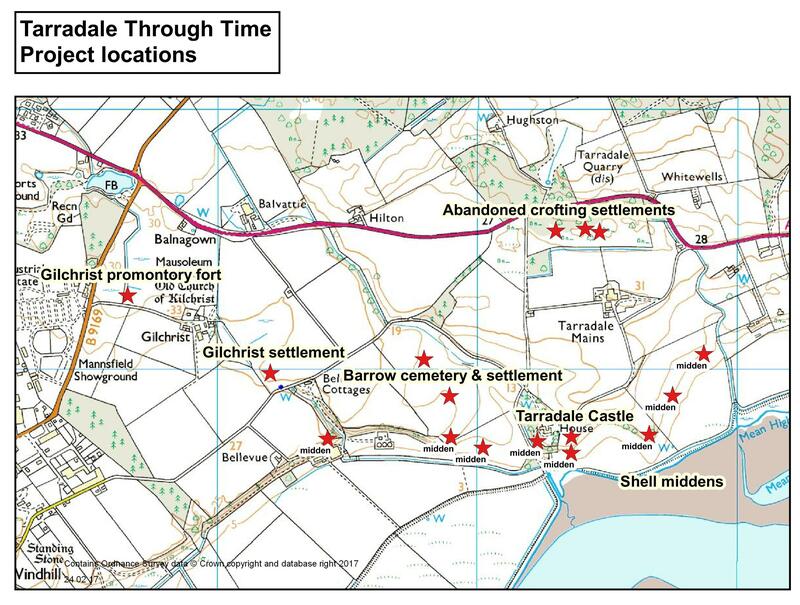 Field walking still continues under the auspices of the Tarradale Archaeological Project and this is an important research method in its own right as it is through field walking and mapping of finds that clusters or “hotspots” that suggest centres of activity in the past have been identified. Persons interested in or wanting to volunteer for the project should email tarradalethroughtime@gmail.com. 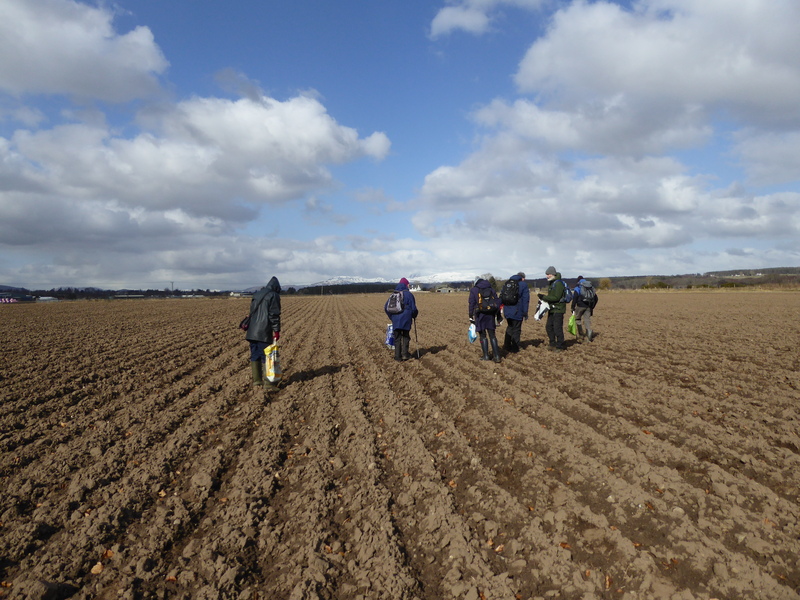 Above: Field walking at Tarradale, March 2018. Below: Video of a short talk given by Eric at the Highland Archaeology Festival Conference, Inverness following the end of excavations in October 2017.